The new art season in town has just begun, and most galleries in Alserkal Avenue have started new shows. However, one of the shows that is receiving a lot of interest is Hybrid at Ayyam Gallery, AlSerkal Avenue. The show highlights the work of Bahrain's Sheikh Rashid Al Khalifa. The royal family is known to be art patrons and Sheikh Rashid took things a step further. Right from a young age, he knew that he wanted to be an artist. Having studied arts at England's Hastings College of Art, he has worked with artistic genres such as realism and impressionism in his 40 year career; he now has moved towards Geometric Abstraction. Having exhibited at Art Basel Miami Beach, the Sharjah Biennial and La Biennale di Venezia (The Venice Biennale), he is one of the most prominent names in Arab art. This exhibition looks at his work from 2010 to 2017, and you will notice that all pieces play with conclave shapes. Says Sheikh Rashid, "It was a process. I did not plan on it, but it just holds an interest for me." This, combined with his love of bright and happy colours, gives his work a feel of Op-Art. 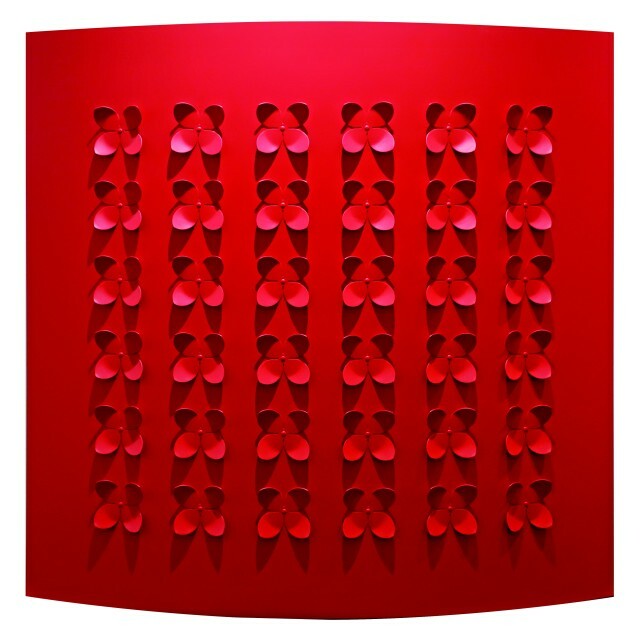 One of the early pieces, from 2010 is in black and red with lacquered enamel on aluminum. It almost looks like there is a gauze of paint on the red dot. "This piece was part of a show called Fabric of Society. The lines represent society, and how it is made of different regions and ethic groups," he said. The use of aluminum is also something that is typical of his work. "I tried many metals, and while all metals are not easy to work with, I found aluminum worked best," he added. Another work that received a lot attention was from 2015. It has a polka dot effect in multiple colours on a white background, and is geometric. "Again this reflects society and its many ethnic groups," he explains. He had hoped that the dots would have movement, but since that did not happen, he says with a smile, "Next time, for sure." There is a very clean feel to his work, each piece is complex, mixing geometry, surface and colour. And while they are mounted as paintings, they do have a sculptural feel, thanks to the three dimensional nature of all the works. Hence, the name of this show - Hybrid - works perfectly. Hybrid is being held from January 20-March 10.